What’s the best credit card authorization form? Learn best practices for 2017 and 2018 card not present credit card processing based on the latest Payment Card Industry Data Security Standards (PCI compliance), Visa, MasterCard and other rules. This webinar is ideal for credit managers and any entity that is currently using paper credit card authorization forms, or encrypted digital forms. Christine Speedy will review related compliance rules, including PCI and October 14 Visa Stored Credential rules, consequences for non-compliance, and solutions to replace traditional paper credit card authorization forms. Live Q&A. Register now for the credit card authorization form webinar Nov 8, 2017 11:00 AM in Eastern Time. TIP: For PCI Compliance, you need a current web browser and you’ll need one for this webinar too. Read this article and take the free browser test. 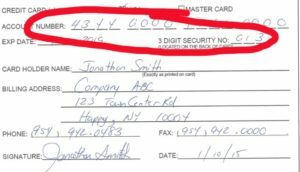 This entry was posted in Credit Card Authorization Form, security by Christine Speedy. Bookmark the permalink.